What does this sign mean at a junction? Yield to all heavy goods vehicles. Slow down and stop for pedestrians. Yield to traffic on the major road. Yield to traffic coming from your right. 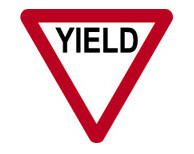 Explantion: At a junction, the YIELD sign tells you that you must give way to traffic on a major road ahead. This means that you must slow down and be prepared to stop.